According to audiophiles and technicians, every home theater system needs the best home theater subwoofers. Yes, you might have a speaker for your television set, but when you include a subwoofer, you will experience a significant difference in the dynamics and balance of the audio produced, especially when you are watching movies or even listening to music. That is because a subwoofer is a really loud speaker that delivers better low-pitched and bass audios. When you decide to purchase a subwoofer for your home’s entertainment or living room, you will be impressed by the number of available brands and models. They come in various sizes, designs, and features that you might either already know or not have heard of in your lifetime. Nonetheless, you should always consider the fact that if you want to have the best home theater subwoofers, you must prepare yourself to shell out some cash. Basically, they are electronic devices which will mean that they will never come at a meager price. Indeed, the budget is always the number one concern, but you should also always look into the quality of the product since they can be a lifetime investment. One thing to remember, though, is that there is no perfect subwoofer available. Meaning, each unit will have its own drawbacks. Hence, to help you decide, we will narrow down your choices by reviewing three units. This 16.1 x 14 x 14.4 inches and 26 pounds subwoofer has a color black and can be bought as a product only or with a professional installation offer. The manufacturer incorporated a 10-inch cone driver that has a polymer composite and a dynamic balance. Likewise, the huge bass installed in it has an amplifier that has high current as well as a dynamic power of 100 Watts and continuous power of 50 Watts. In addition, a laser-based technology called Klippel measurement has also been incorporated. For the product’s enclosure, it is made entirely of MDF that has zero resonance and baffles of 0.75-inch thickness as well as quality internal bracing. The precise and deep sound produced has enhanced linearity. This subwoofer is easy to connect to any home theater system because it has grade line speaker inputs and outputs. This particular speaker has a smart sensing capability which means that it can sense circuits so that it can automatically turn on and off when needed. 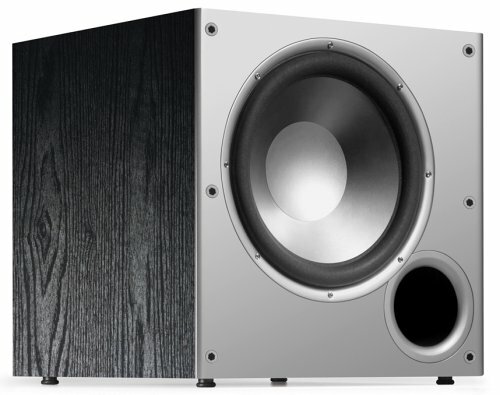 The bass sound and the blending characteristics of the subwoofer with the front stage-speakers can be adjusted easily since there are designated volume control knobs. At various sound levels, the sound coming out of these speakers are not really clear but rather muffled. Apart from muffled sounds, the feedback you may receive is annoying. At times, the bass is not clear but produces a humming sound. The wires and some of the channels might fail straight out of the box. Plays at extremely high levels and sometimes exceed 85 decibels which may pose a danger when you are exposed to it regularly. Hence, this might only be suitable for parties and events.